Walking along Greenwich Street in the West Village, you will come upon this ivy-draped wall. What could be behind all that greenery? What a wide gate you have! The better for me to peer inside. If this odd little house seems as if it was plopped down in the middle of townhouses and apartment buildings, that’s because it was. This 19th-century farmhouse used to be in the part of the Upper East Side known as Yorkville. According to this article from the Greenwich Village Society for Historic Preservation, it served as a restaurant in the early 20th century. Later, it was rented out, most famously in the 1940s to Margaret Wise Brown, author of many children’s books including Goodnight, Moon and The Runaway Bunny. It is not quite clear whether she wrote Goodnight, Moon there, but judging by the photo in the linked article, she did have a charming little doggy. 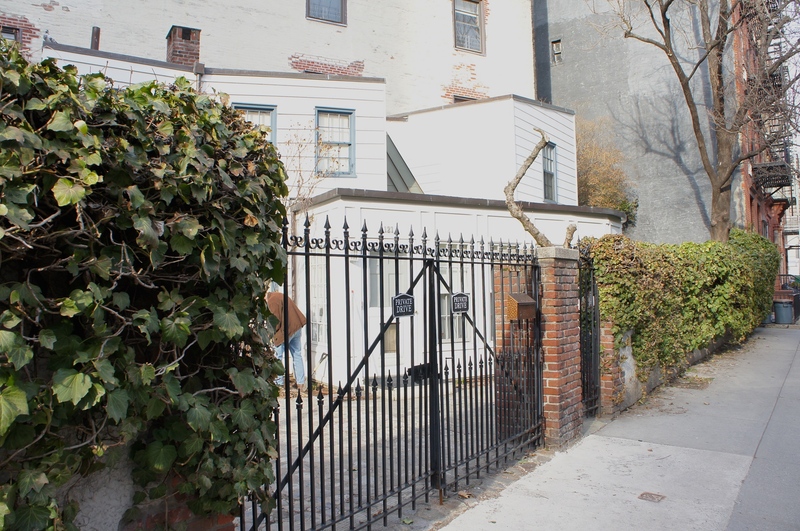 In 1967, the house was moved to the West Village to avoid demolition when the Archdiocese of New York planned to build a nursing home on the Yorkville site. With its low profile and odd angles, the house is a charming oddity in the neighborhood. This post by a location scout in New York pointed out that the front entrance even has a doggy door. I wish I could slip through those gates and sniff around the yard—and maybe even sneak inside for a peek. The property was listed for sale last year as a development site priced at $20 million. But any human looking to develop the site will have to face a public review process and apply for a permit from the Landmarks Preservation Commission. Perhaps instead of dealing with all that hassle, the new buyers could leave the property as is and allow me to live there as the canine caretaker of the house. After all, the door is already set up for me. And I would be more than happy to welcome visitors—as long as they bring treats. Will This 200-Year-Old Farmhouse Be Torn Down for Condos? Thank you, Roy and Goretti! I will do my best. Stumbled across your post while looking at what others had posted for this photo challenge. And found a sweet doggy! My sweet doggy is a St. Bernard who will turn 4 next month. She wonders what is behind walls, and doors, too! Thank you for visiting! Happy early birthday to your St. Bernard. What wonderful history, Albert! I’ll have to share your post with LOUD Mom when she gets home from work. She’s an archaeologist specializing in 19th and early 20th century urban sites, so this is right up her alley! Thank you for another entertaining and informative piece! Thank you, Carol. She would probably find this house most interesting, indeed. I think a dog caretaker would be perfect. If you need a reference, feel free to let Choppy and me know! Hey Albert, I think you and Archie would get along great, he’s an intrepid exploring sniffer like yourself and would also go the extra mile to get a new look at an unusual place that could hold a world of old smells. What joy! Luckily … sorry SADLY … this was well before The Bean and her honed snout! I used to live just a few blocks from this house. I would frequently find any excuse to pass by it 🙂 Great post about it! It is so charming, isn’t it? Thank you for stopping by and commenting!